Based on reviews from 154 experts and 15,323 users. Learn how our rankings work or see our guide to Adidas firm ground football boots. Updated Apr 2019. Football, the oldest sport in the world, has been played on outdoor fields since time immemorial. It was only in recent years when indoor football boots were introduced that it was played inside covered courts, gyms, and arenas. 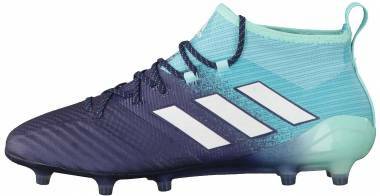 Therefore, it is no wonder that Adidas, one of the oldest soccer shoe manufacturers, has quite a number of firm ground football boots released to date. 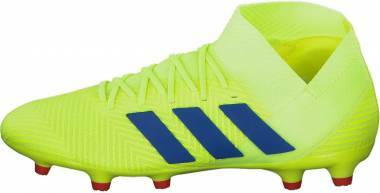 For most players, football has become synonymous to Adidas football boots. Outdoor football is played on different surfaces, including firm grounds, soft grounds, and turf fields. Considered by some as the universal football boot, below is a discussion of what a firm ground football boot is and what are the fundamental parts of the shoe that you need to know. In the world of football, firm ground, sometimes referred to as FG, means dry and firm natural fields with short-bladed grass. 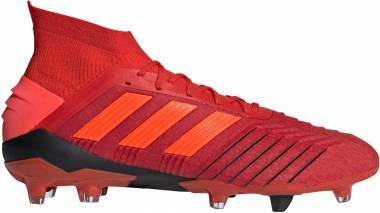 Adidas firm ground football boots usually have 12 conical studs that are molded to the soleplate. It is not difficult to look for Adidas firm ground football boots because all their silos have FG variations. 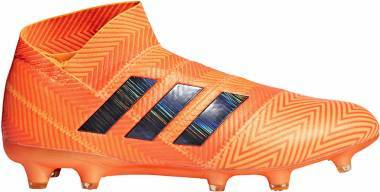 Although some might consider an FG football boot to be the universal football shoes, Adidas FG football boots are not meant to be played on soft ground, artificial, nor indoor playing surfaces. The geniuses behind the German brand know that using a firm ground football boot on the wrong playing surface will not only result in unnecessary damage to the shoe but also career- and life-threatening injuries to the user. That is why they have created soft ground (SG), artificial grass (AG), turf field (TF), and indoor court (IC) variations for muddy pitches, artificial grass fields, turf surfaces, and hard floors respectively. Ideally, a player should invest in at least one pair of these surface-specific football boots. But if you are on a tight budget and you play on multiple surfaces often, there are also football boots that can be used on both firm ground and artificial grass playing surfaces. 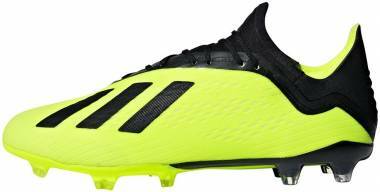 In fact, Adidas was the first to release hybrid football boots in their Adidas Ace 15 and Adidas X 15 series. 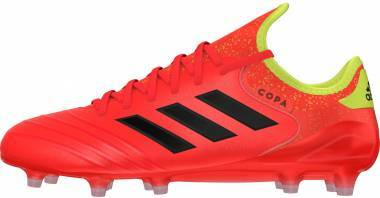 Most Adidas firm ground football boot upper features the Non Stop Grip or NSG technology. It is composed of small 3D dots that act as the shoe’s weather control element. It allows the football boot to maintain an optimum level of ball control in both wet and dry conditions. Recently released Adidas firm ground football boots, such as the Adidas Copa 18.1 Firm Ground, uses an integrated X-Rap Vamp Cage to replace the stitching on the forefoot of the upper. This technology reduces ball slippages and enhances ball control. It also improves the shoe’s durability by keeping the shape of the leather upper longer. Sprintframe. This durable midfoot chassis that helps keep the player’s foot close to the ground. It was inspired by bridge designs and its ability to hold a large amount of weight. As a result, the SprintFrame helps keep an Adidas firm ground football boot lightweight while maintaining the wearer’s stability on the pitch. The Sprintframe soleplate is found on the Adidas X 17+ Purespeed and Adidas Ace 17.1 Firm Ground. Totalcontrol. The Totalcontrol system features a soleplate that has ten large conical studs and 36 studs of varying lengths. An Adidas firm ground football boot that has this soleplate and stud configuration is also suitable for use on artificial grass surfaces. They are referred to as FG/AG football boots. 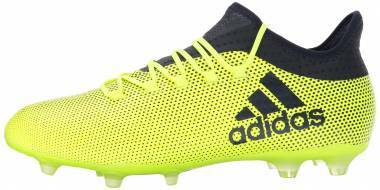 An example of an Adidas firm ground football boot that has the Totalcontrol system is the Adidas Ace 15.1 Leather. An improved version of this innovation, called the Totalcontrol 2.0, is found on the Adidas Ace 16.1 Firm Ground. Torsion Frame. The Torsion Frame is a soleplate that has a thermoplastic arch support frame in the midfoot. This technology allows the forefoot and rearfoot to move independently from each other. It helps prevent improper arch flexing as well as provides control during movements and strides. The Torsion Frame is found on the Adidas Nemeziz 17.1 Firm Ground. Because it provides excellent support when running and making lateral movements, it is also present in some Adidas running shoes. Speedframe. This lightweight soleplate and stud pattern system features arrowhead studs in the forefoot and conical studs in the heel. This combination is the perfect recipe for speed as it promotes acceleration and braking on firm grounds. 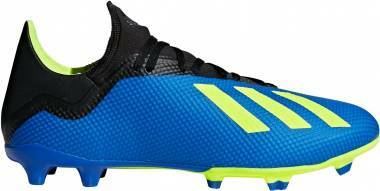 It is found on the Adidas X 18.1 Firm Ground. Rounded cleats offer a decent amount of traction and maneuverability on firm ground pitches. They effectively allow quick releases because they do not cut into the ground as much as bladed studs do. A classic example of Adidas firm ground football boot that uses all-conical rubber studs is the Adidas Copa Mundial. The stud configuration of this vintage Adidas firm ground football boot is composed of 12 rounded studs. It is also used in newer-generation Adidas firm ground football boots such as the Adidas Ace Purecontrol 17+ Firm Ground. Soleplates with all-conical studs are also found underneath the Umbro UX Accuro, Puma evoSPEED 1.3 Firm Ground and Nike Magista Onda. Bladed studs are found on most modern Adidas firm ground football boots. These cleats are thin and pointed. They offer aggressive bite on firm ground surfaces and are useful when making lateral movements. Bladed cleats also provide superior control with minimal stud pressure. 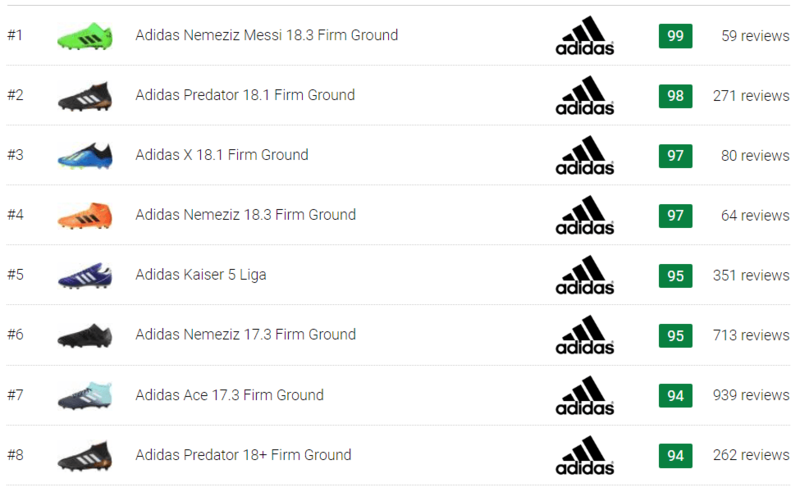 Examples of Adidas firm ground football boot that uses all-bladed studs is the Adidas Predator 18+ Firm Ground and the Adidas Nemeziz Messi 17.1 Firm Ground. Soleplates with all-bladed studs are also found on Nike football boots, such as the Nike CTR360 Maestri and the Nike Mercurial Superfly collection. The New Balance Furon 2.0 Firm Ground uses an all-bladed stud configuration as well. There are also football boots with a combination of bladed and conical studs. These football boots offer excellent maneuverability from the conical studs and at the same time maximum penetration for the bladed ones. Popular football boots that utilize a mixed bladed and conical stud configuration include the Nike Hypervenom Phantom III Firm Ground and Puma One 18.1 Firm Ground. This is the part of the football boot which covers the upper of the foot. It refers to everything that is found above the midsole. The upper of Adidas firm ground football boots are made of different kinds of materials, from natural leather to synthetic mesh and knitted materials. One of the oldest and most popular Adidas firm ground football boots that use premium kangaroo leather is the Adidas Copa Mundial. It is Adidas ‘ top-selling football boot model of all time. Each pair is handmade with care by a team of Adidas technicians. Adidas Kaiser 5 Liga, a takedown model of the Copa Mundial, is another popular Adidas firm ground football boot that uses natural leather for the upper. Using 100% full-grain leather for the upper, this Adidas firm ground football boot molds to the shape of the foot after a couple of wears. 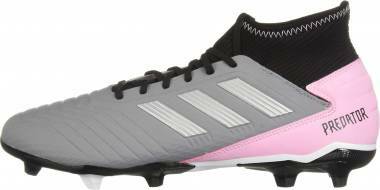 Adidas firm ground football boots that use synthetic leather for the upper are generally more affordable than the ones with natural leather. 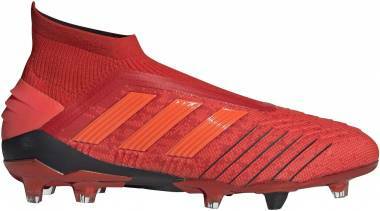 However, with the Adidas Predator LZ TRX Firm Ground, that is not the case. It features a synthetic leather upper called the HybridTouch. 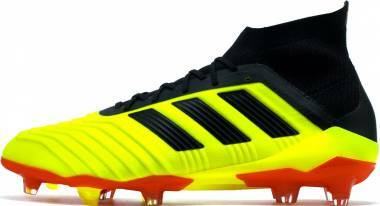 This durable and waterproof material is also found on the upper of another Adidas firm ground football boot, the Adidas Nitrocharge 1.0 FG. Another first for the German brand is the limited-edition Adidas Samba Primeknit launched in March 2014. Its upper is made entirely of knitted yarn. As a result, the weight of this football boot is reduced to only 165 grams. Every single piece of yarn is coated with a waterproof polymer. However, this is not the first shoe from Adidas that uses a knitted upper. This technology has been used in Adidas running shoes a few years before its launch in their football shoe category. 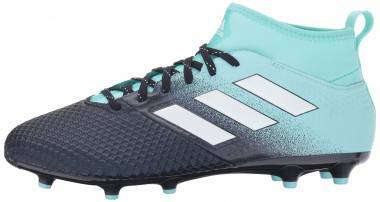 Another Adidas firm ground football boot that uses Primeknit is the Adidas Ace 17.1 Primeknit FG. It features a natural feel of the ball while providing solid forefoot protection. With the rise of laceless football boot, the German brand released their second laceless football boot in the Adidas Nemeziz 17+ 360 Agility Firm Ground. The first laceless Adidas firm ground football boot being the Adidas Ace 16+ PureControl. The first-generation Adidas Nemeziz football boot uses several Torsion Tapes that make up the 360 Agility Bandage system. The use of tapes on the upper took inspiration from the ancient ritual of wrapping the foot with medical bandages in order to increase strength and agility. Some Adidas firm ground football boots, such as the Adidas Copa 18.1 Firm Ground, use a special kind of insole called the Ortholite insole. It is an open-cell structure that creates an effective moisture management system. Using the Ortholite insole provides a cool and dry shoe environment making the football boot healthy for the players to wear. Are Adidas firm ground football boots for use on firm, dry grounds only? 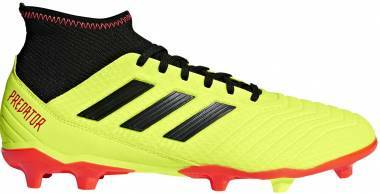 Adidas firm ground football boots can be used on firm and slightly damp pitches as well. However, it is not highly recommended for indoor and artificial surfaces. 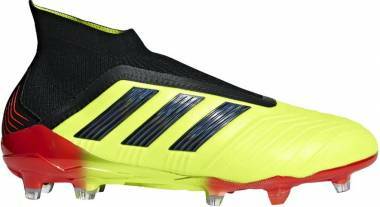 Can I use my Adidas firm ground football boot on artificial grass and soft ground surfaces? Using an Adidas firm ground football boot on surfaces other than firm ground is not recommended as it may deem dangerous to both the shoe and the user. How can I tell an Adidas firm ground football boot apart from other football shoe variations? For somebody who is new to football, an Adidas firm ground football boot may look similar to its SG and AG counterparts in that they have protruding cleats underneath the soleplate. However, upon closer inspection, these cleats differ in length and placement. An Adidas firm ground football has 12-15 conical or bladed studs that are moulded to the soleplate whereas an Adidas soft ground football boot has removable studs of various sizes. Adidas artificial grass football boots have more than 15 studs underneath its soleplate. Adidas turf football boot soleplates have multiple rubber nubs that work well on astroturf surfaces. For Adidas indoor football boots, they do not have protruding cleats. Instead, these types of football boots utilize non-marking rubber soles. What are FG/AG football boots? Nowadays, companies have become more user-friendly by releasing football boots that can be used safely on both firm ground and artificial grass pitches. 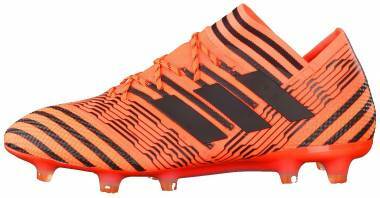 In fact, it was Adidas that started this trend in their Adidas Ace15 and Adidas X15 series. These football boots are often distinguished by the FG/AG or Multiple Ground suffix at the end of the model name. Well-known FG/AG football boots from other brands include the Nike Mercurial Superfly VI Club Multiple Ground, and Puma Future 18.1 Netfit FG/AG.